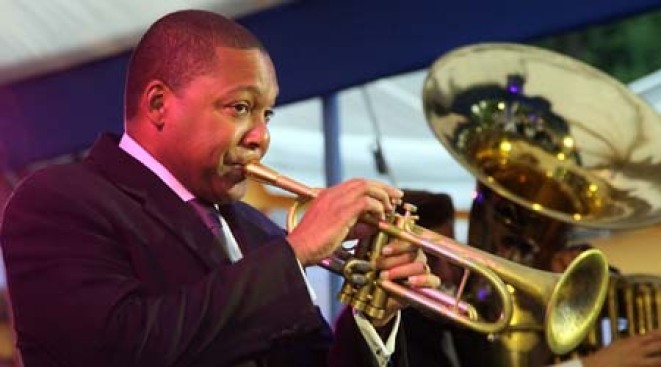 Wynton Marsalis is just one of the jazz greats paying tribute to the late Thelonious Monk at this week's Monk Festival around town. MONASTIC: With his rule-smashing ivory-tickling and his wild public persona, Thelonious Monk captured jazzbos' imagination - but he never quite got his due in the wider public eye. The Monk Festival is helping change that: A five-day smorgasbord of Monk tributes kicks off tonight and runs through 11/25 at venues around town; greats like Wynton Marsalis preside. Various times. BLOND AMBITION: If your last Nordic CD purchase was The Cardigans, get schooled in new trends in Scandinavian music - from pop to electronica - with Northern Transmissions 2, a painfully hip evening at Scandinavia House of music videos and short features set to music, all imported from the land(s) of the midnight sun. 7PM. AUTHOR, AUTHOR! : Sure, he won the Pulitzer Prize for Angela's Ashes - but what about his three decades of teaching at New York public schools? That's what Frank McCourt will tackle at his Cold Floors & Warm Hearts fundraiser at Carroll Gardens' PS 58. 7:30PM.